The meeting was opened by host MEP Danuta Jazlowiecka. Cathalijne van Doorne and Joop van Griensven set the scene. Joop, a person living with fibromyalgia, spoke about how overall functionality and the ability to stay at work was hugely important to those affected by chronic pain. He spoke about how being unable to work impacted on quality of life, including decreased income and increased isolation. He said the EU could play a role by ensuring the European Social Pillar and the European Semester were optimised so that those living with brain, mind and pain disorders were retained, rehabilitated and/or reintegrated into the workplace – if desired. The results of a survey by Pain Alliance Europe on this topic will be available soon. After these opening presentations, the first keynote speaker was then introduced: Laure Delbecque, Associate Director, Patient Reported Outcomes, Pharmerit International. She spoke about the role that policy-makers could play in ensuring that Patient Relevant Outcomes Measures [PROMs] are used to better understand and assess patient experience. She said that the regulators and, an increasing number of, payors were prepared to use PROMs. However, she encouraged policy-makers to think beyond clinical trials, and to support the use of PROMs via exit interviews, qualitative research, wearables, preference studies, etc. 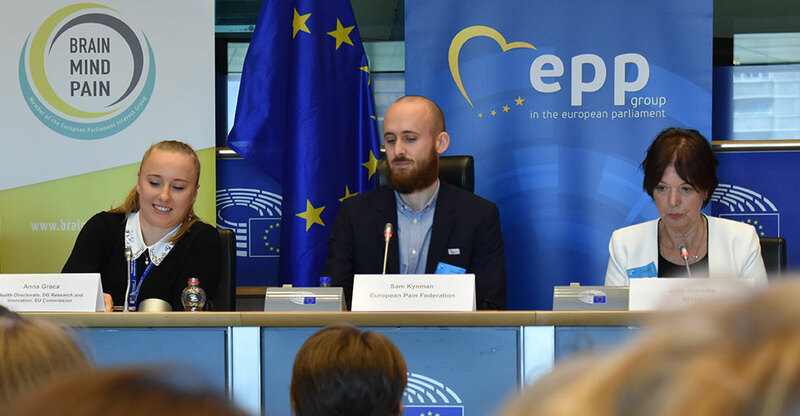 The moderator, Donna Walsh – EFNA Executive Director, then asked the panel to contribute their thoughts on how PROMs could be better integrated into R&D, but more specifically in policy and decision-making. Kaisa Immonen, Director of Policy at the European Patients’ Forum said she preferred to speak about Patient Preferred Outcomes. She said groups like ICHOM and the OECD were committed to working on this topic – but emphasised that high level leadership was required to translate recommendations to actions. She called for obligatory consultation with patients bringing a diverse perspective. The next panelist was Christopher Bidad, Senior Director, Regional Health and Value Lead, Patient and Health Impact at Pfizer Inc. He said that industry was working more on collecting Patient Relevant Outcomes Measures, which was being enabled by improvements in technology. He called on the EU to further support the development of such technologies and the usage of the results generated. However, he called on the regulators and payors to broaden the scope of the accepted evidence, to encourage industry to continue to collect this data. A clear path forward is required, he said, and incentives could be considered to encourage the collection and use of these outcomes. Vinciane Quoidbach, Research Project Manager at the European Brain Council, spoke about their Value of Treatment project and its innovative approach in mapping the patient journey and identifying the treatment gaps throughout the care pathway. She said it was clear that treating patients in their preferred way, would lead to decreases in both cost and burden of disease. The final speaker on the panel, Ruth Zaslansky of the Pain-Out project, spoke about how collected patient report outcomes, on the treatment of post-operative pain, allowed for the building of extensive data registries which improved clinical decision making. This real-world data could be used for policy making and decision-making, and she called on the EU to support further projects in this field. Donna Walsh wrapped up the panel by saying there was lot of food for thought which the group could take further in subsequent meetings and via their ongoing, related initiatives. The second panel was moderated by Sam Kynman of the European Pain Federation. 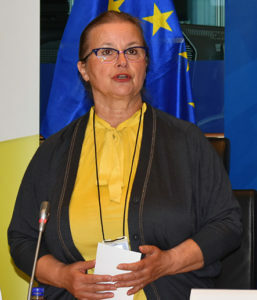 He introduced keynote speaker: Anna Graca of the European Commission, who presented the draft framework of the HorizonEurope funding framework. She emphasised that there would be a new approach to partnership and called for patient organisations to be proactive in positioning themselves as key partners in project consortia. She also said there would be an ‘inventory’ of current partnerships conducted and asked all stakeholders to contribute to this task. She emphasised the new mechanism of Missions. These missions, she said, will relate the EU’s research and innovation to society and citizens’ needs, with strong visibility and impact. 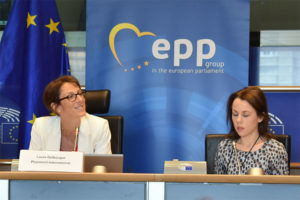 She mentioned that a proposed ‘brain’ mission had already been produced by the European Brain Council, and that a similar document had been received from the epilepsy community. She said the Commission expect to be bombarded by these suggested missions. 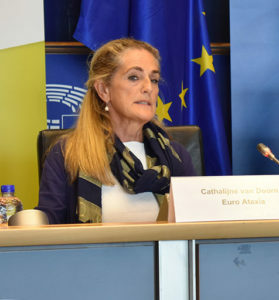 She mentioned that the strategic planning to prepare first work programmes under Horizon Europe, including co-design of missions and setting up of partnerships, would take place in the second half of 2018 and throughout 2019 – and she encouraged the brain, mind and pain community to get involved. We welcome the improvements suggested in the “Horizon Europe” proposal, including increased funding, but we believe that this is not enough to meet global challenges, as well as to address the historically low success rate that is currently seen in Horizon 2020 – particularly in the field of brain, mind and pain disorders. We would like to see a new budget of at least 120 billion euro to meet the ambitions formulated in the FP9 proposal. We are concerned about the provisional budget of 7.7 billion euro allocated to the “Health” cluster under Pillar II. We believe that adopting the proposal as it stands will be insufficient to effectively address the societal challenges associated with healthcare in the field of brain, mind and pain disorders. We are encouraged by the increased budget for the European Social Fund [ESF+]. However, this is to be spread across a wider range of activities – and we need to ensure that actions in the area of health are supported and the instrument promoted at member state level for this purpose. We realise that health remains a national competence but we would like to see ongoing and increased support for health-related actions where cross border cooperation brings added value e.g. work in the area of chronic diseases, HTA, etc. This should be reflected in the proposal. In reply, Anna Graca explained that the budget increase was already very substantial as the UK was leaving the EU and so their contribution was no longer included. So, an increase in the overall budget would be difficult – but perhaps it could be reallocated/reprioritised. She also suggested that less siloed thinking should be pursued. The final panelist was Mark Fladrich, CCO of Grunenthal who spoke about Grunenthal’s support for the Brain, Mind and Pain Patient-Centred Innovation Grant. The grant aims to create an environment where patient centricity is the basis for future initiatives. This will implicitly contribute towards creating a sense of innovation, with direct impact on patients’ needs, and towards increasing awareness of chronic pain conditions and neurological disorders. The awardees of the grant were announced over a lunch which followed the meeting. Next article Future of Healthcare in Europe – What next for brain, mind & pain?